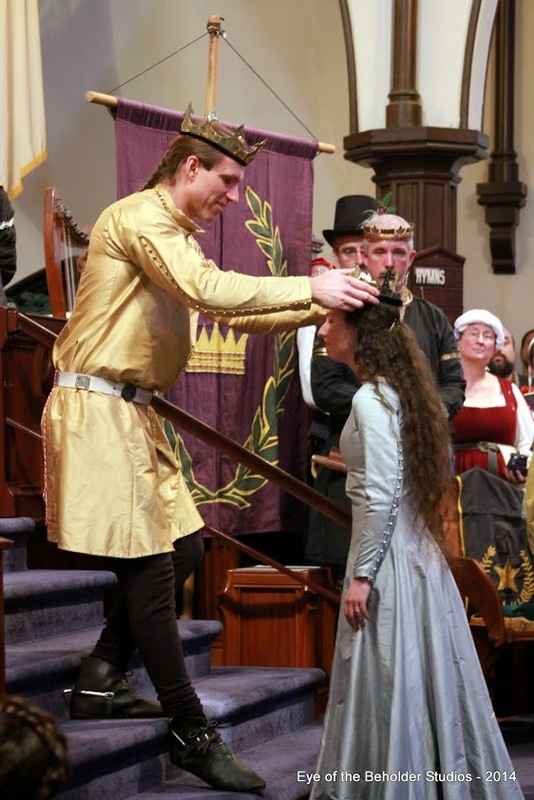 The dates and locations for the upcoming Coronation and Crown Tourney have been announced. 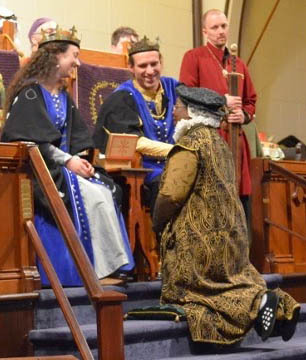 Coronation will be held on April 11 in the Canton of Black Icorndall (event site – Wallingford, PA). 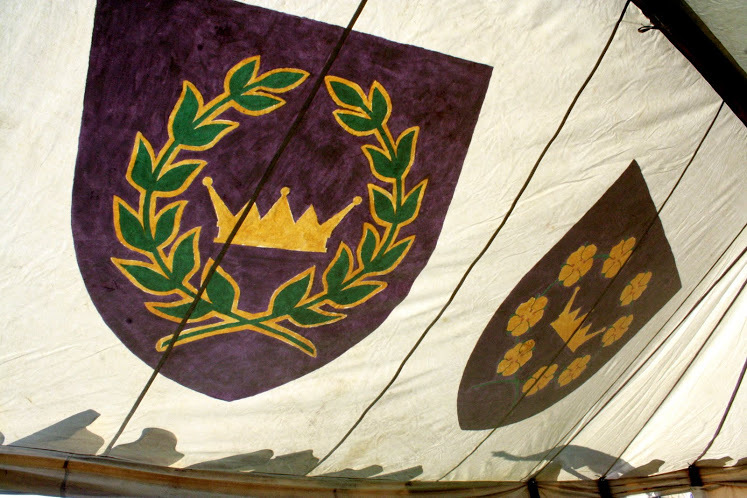 Crown Tournament will be May 2 in the Barony of An Dubhaigeainn (event site – Middle Island, NY). For more information, click on the links to go to the event announcements. 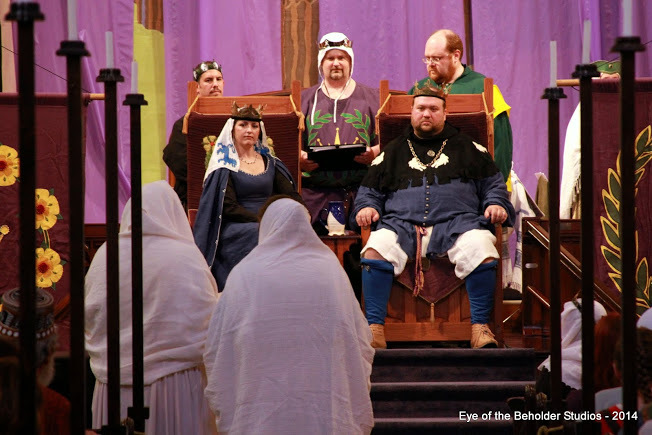 The sun shone brightly as the nobles and great officers of the Kingdom gathered yesterday for the Coronation of Their Majesties Edward and Thyra in the Barony of Bergental. 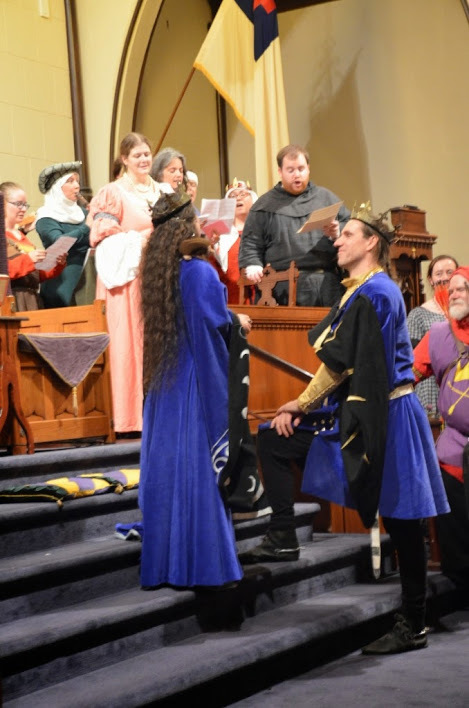 The ceremony took place in the sanctuary of the First Congregation church, which had a lovely medieval ambiance, with a vaulted ceiling and beautiful stained glass windows. 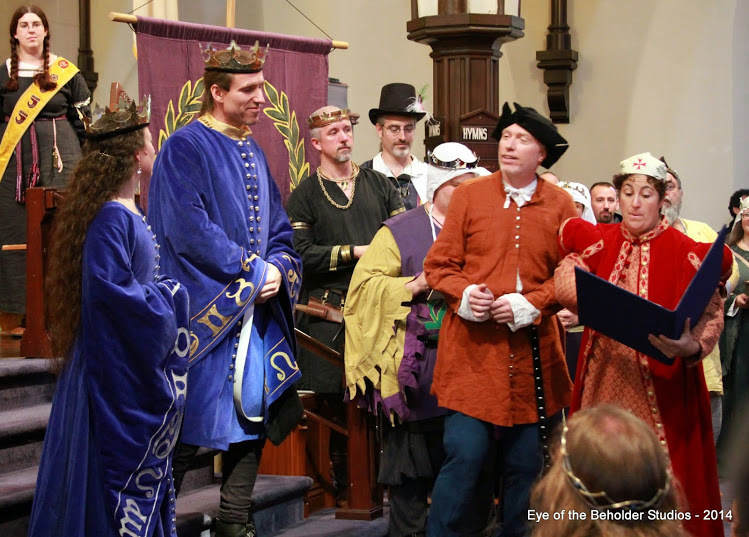 The Last Court of Their Majesties Brennan and Caoilfhionn opened with their Majesties recognizing those gentles who had staunchly supported them during their reign. A full court report will be published separately as soon as it becomes available. 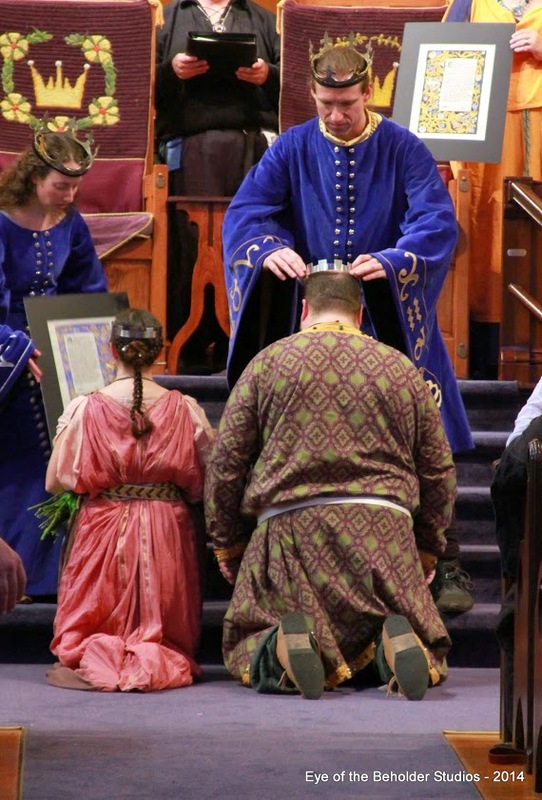 The presentation of awards was interrupted by the approach of two Sibyls. 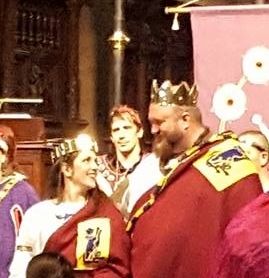 They announced that the prophecy regarding their reign was incomplete, adding a touch of levity to the proceedings by explaining that “No, seriously, there was a piece of papyrus stuck to the back”. Warned that dire things would befall the kingdom he loved, his Majesty agreed that they must heed the words of the Oracle and end their reign. Her Majesty dismissed her guard. Both shared moving words of their love for the people of the East, in response to which the assembled populace rose spontaneously to their feet in tribute. Prince Edward and Princess Thyra were summoned, entering into Court in splendid gold and silver garments, escorted by their household. 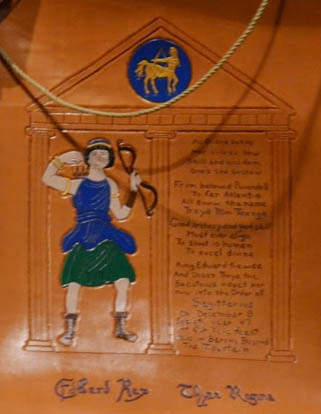 As they advanced down the mail aisle, twelve periaktoi (an ancient theatrical device by which a scene or change of scene was indicated) bearers carrying the zodiacal signs made their way down the side aisles. His Majesty removed her Majesty’s Crown, giving it into the keeping of Herald, then removed his own, and crowned Prince Edward. 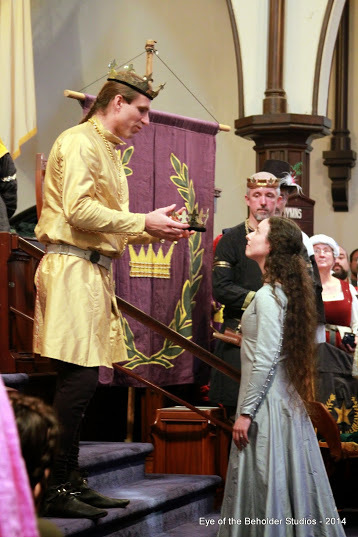 King Edward then crowned Queen Thyra. Brennan and Caoilfhionn exited. 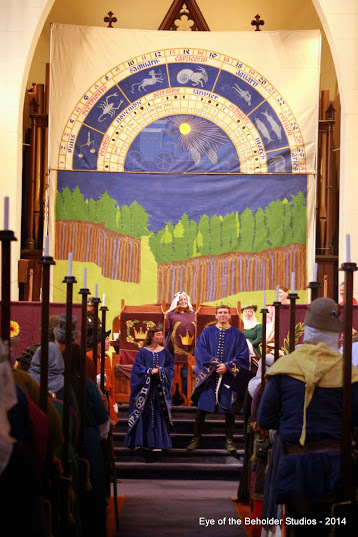 Sumptuous blue robes were brought forward to clothe their Majesties, and the purple drapes behind the thrones were removed to reveal a huge zodiacal mural. 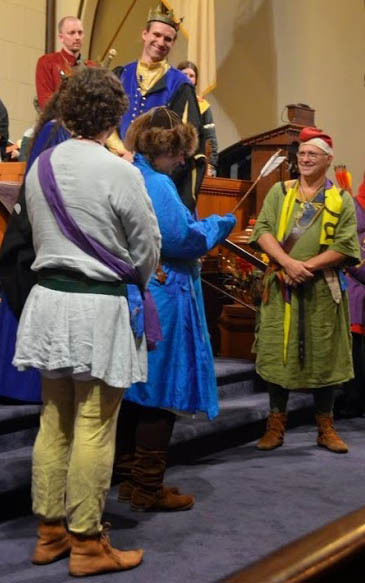 As the robing proceeded, the zodiacal prophecies were read, punctuated by the periaktoi bearers proceeding up the aisles in turn, and pausing at the front as the verse corresponding to their sign was read. Upon conclusion of the readings, two astrologers entered, one bearing a large book. Again injecting a bit of levity, the two predicted that the reign of Their Majesties would endure for four thousand, and some … hours. 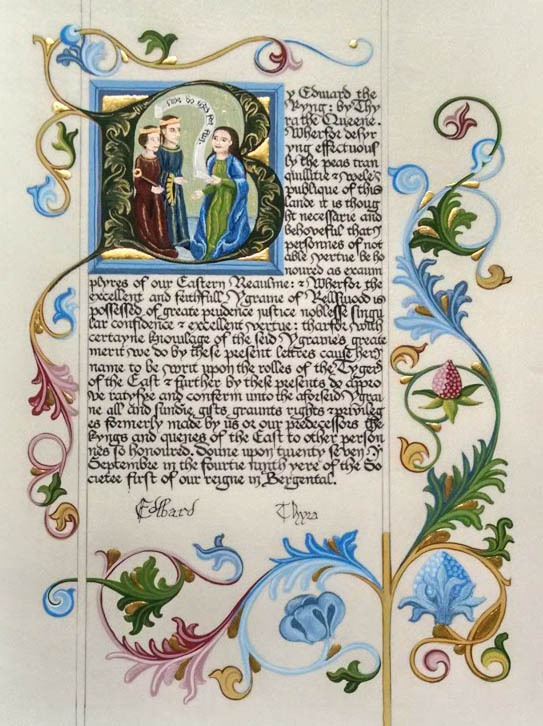 The astrologers having been dispatched, the bearers of the reliquary containing earth from the lists of the First Tournament and the ampulla containing water from the Bay of the Mistlands where the World was born, entered Court. 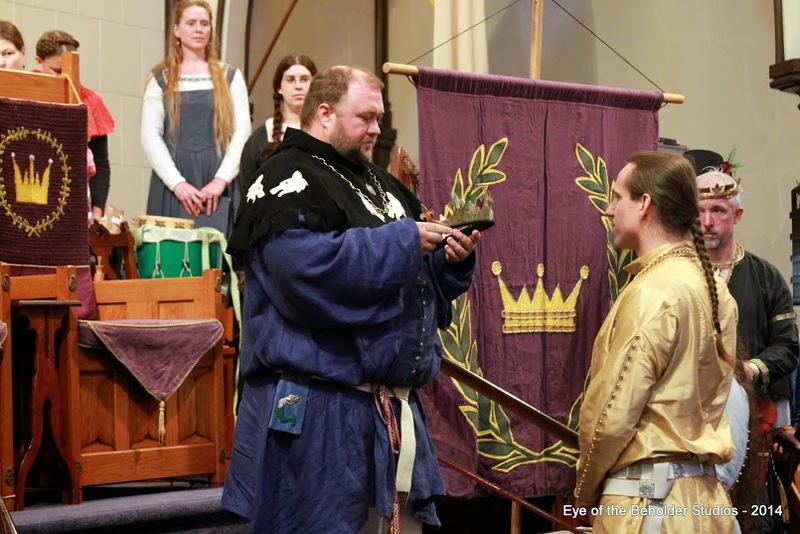 His Majesty swore upon the reliquary and Her Majesty swore upon the ampulla, to fulfill their duties as Monarchs of the East. 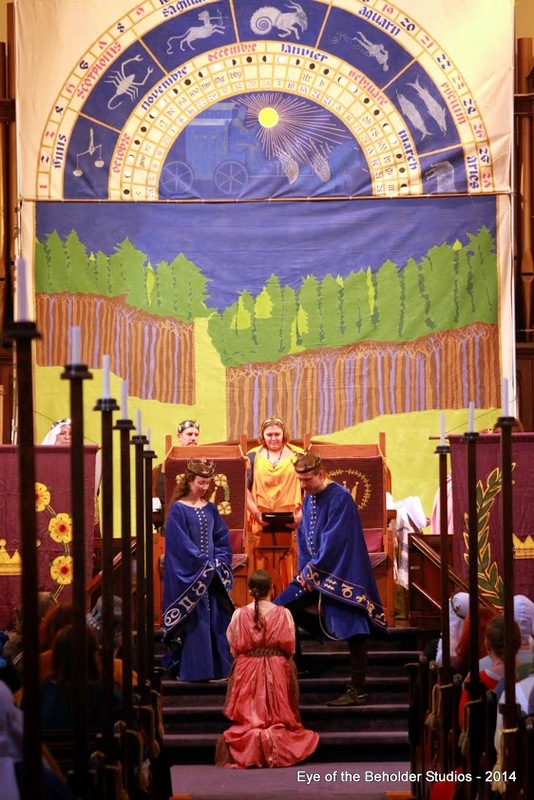 The Kingdom Officers, royal champions, and landed barons and baronesses then offered fealty. 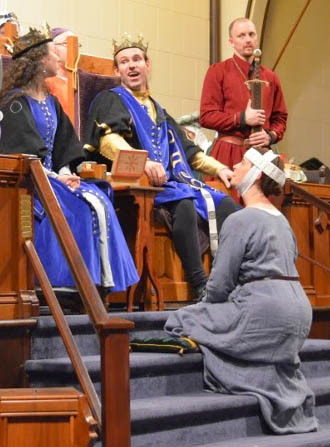 Their Majesties made the first award of their Reign, as they called Baroness Caoilfhionn and Sir Brennan into Court. 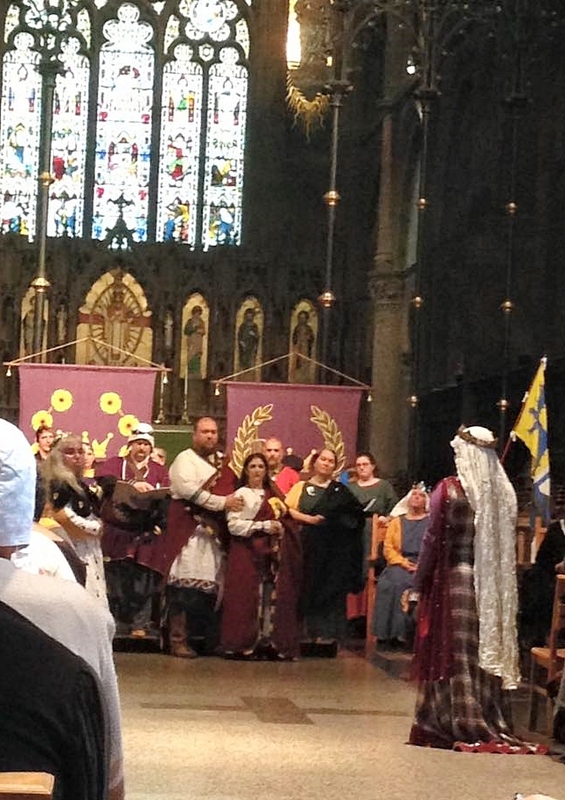 Baroness Caoilfhinn was made a Lady of the Rose with full ceremony, including speakers from all four Peerages. She and Sir Brennan were then made Count and Countess. 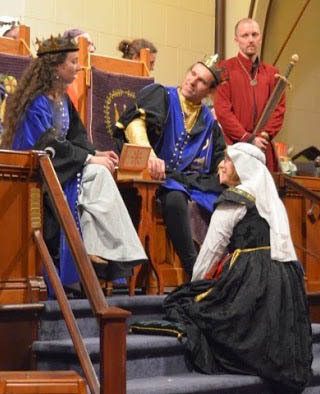 Duke Lucan did them the honor of presenting them with the County coronets which he and Duchess Jana had worn after his first reign. 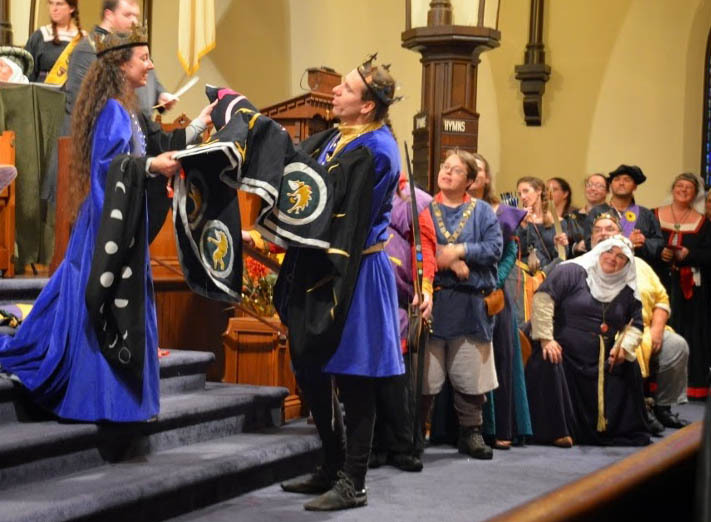 The ceremony was composed by Maistre Lucien de Pontivy and Lady Aildreda de Tamwurthe. Lovely period choral and organ music was integrated through the ceremony. Photos are courtesy of Cateline la Broderesse, used by permission. Since the East Kingdom website is still having difficulties, here are some updates to the event information, as well as the event location and directions which many folks look-up at the last minute. 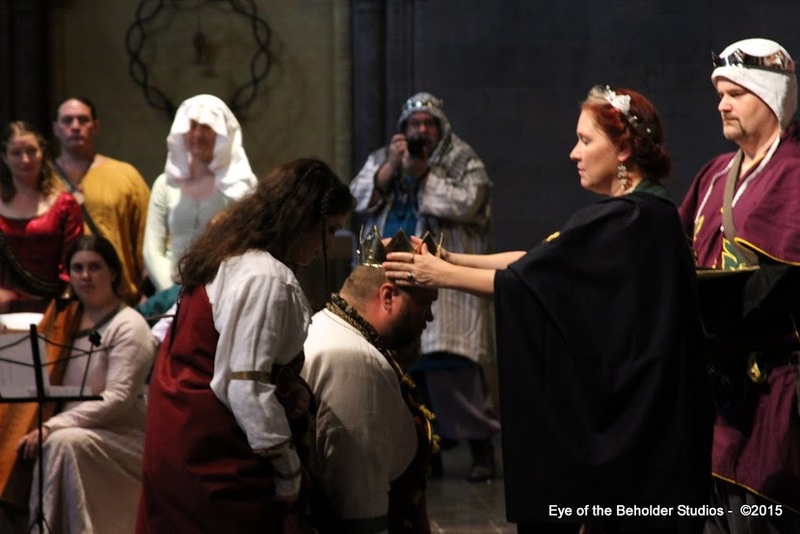 Baroness Cassandra, Event Co-Steward, has posted the Dayboard Menu here. 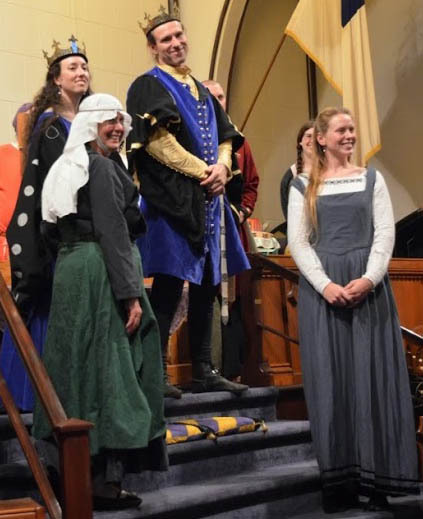 Storytelling in the parlor will include tales of strong Danish women and English valor appropriate for all ages. With the permission of his family, we will provide message books & a video booth to send messages to Master Kali Harlansson, who is in home hospice care. TRAFFIC NOTE: The Big E traffic in the area was significant last weekend. If you can arrive on site by 10 am, you should miss the worst of it. At the Door Event Fees: Adults $15.00; Youths 17 and under Free; $5.00 non-member surcharge added where applicable; dayboard included for all. Site Opens: 9 a.m. Site Closes: 7 p.m. after Court. There is no feast, but a sumptuous dayboard will be provided. SITE RULES: Discreet beer & wine and enclosed flame is permitted in the Fellowship (dayboard) Hall only. Service animals are allowed. The site is fully handicapped accessible. DIRECTIONS: From I-91 in western Massachusetts, take Rte 20 West over the river. The large red brick church will be on your right, opposite the town green. PARKING is available on neighborhood streets, in the Senior Center lot adjacent to the church, and in two school lots on the same block. Look for SCA Parking signs. There is a drop off zone located near the Gate entrance to the site on Lathrop St.